Who will end up paying for this milkshake? 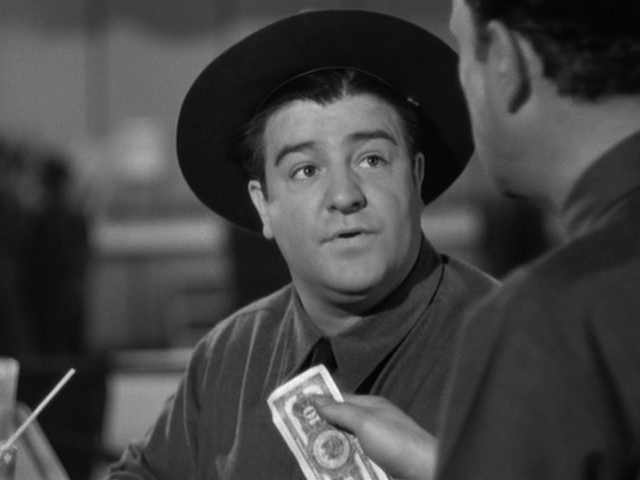 BUCK PRIVATES made back sixteen times its production costs when it came out in January 1941, earning $4,000,000 at a time when movie tickets cost between ten and twenty-five cents. It was a comic commercial for the Selective Service (i.e. the draft) enacted five months earlier as the nervous nation started gearing up for war. 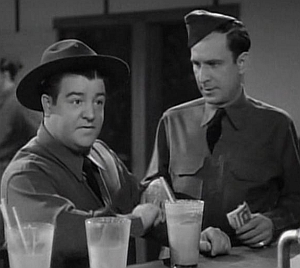 A pair of vaudevillians who’d been working together since 1935, Bud Abbott and Lou Costello starred (they’d featured in One Night In The Tropics in 1940 and stole it) and this daffy hit skyrocketed them into the big time. 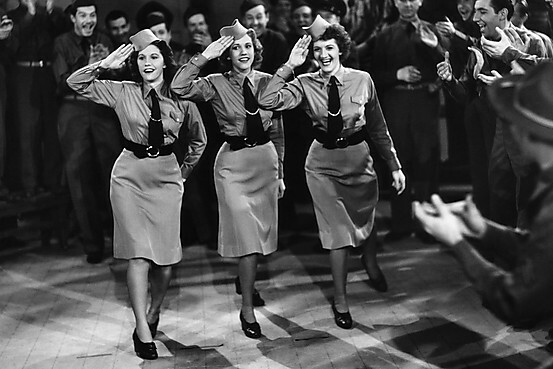 They rapidly followed up with three more films the same year, two of them likewise service comedies–In The Navy and Keep ‘Em Flying–also huge hits. They were quite popular for a dozen years, and remain sentimental favorites today, decades after their rat-a-tat delivery tickled the Roosevelt Era. Along with Abbott And Costello Meet Frankenstein (their best film, ironically also the start of their downturn) this movie was the first exposure your humble correspondent had to these two clowns, on TV in the early 1960s. A new generation adopted them. Much of their first round of flicks hold up well, most of their post-1948 efforts are best left as fuzzy memories. Now you owe me ten. Here, they duck out into the Army to escape the cops (for selling ties without a license) and find out what a swell place it is, with cute dames handing out soda and cookies to the draftees (don’t give those Germans or Japanese a second thought, buddy), kindly officers (uh-huh) and tough sergeants who are really big teddy-bears (which no doubt describes all drill instructors accurately). Apart from the duo doing their super-deft routines, the plot is dispensable. 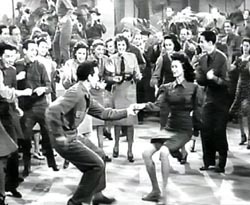 Directed by Arthur Lubin, running a swift 84 minutes, the movie scored two Oscar nominations, for Score and for Best Song, “The Boogie Woogie Bugle Boy Of Company C”. That number, and three more, are performed by The Andrews Sisters, with all their pizazz. Another highlight are the dancers who accompany the sisters on “Bounce Me Brother With A Silver Four”. These crazed hoofers are the ‘World Champion Boogie Woogie Dancers’—and brother, are they! Check out the hip swivel from the amazing Jewel McGowan, then check your blood pressure. With Lee Bowman, Jane Frazee, Alan Curtis, Nat Pendleton and Shemp Howard (on vacation from the Stooges, with Moe’s permission, we assume). Sequel, Buck Privates Come Home, trailing in 1947, two years after the war ended, was also successful, and reasonably funny.